Central bankers these days are seriously trapped. They cannot now reverse their policies for that means they have to admit that they have failed. This is why the Yellen is not so eager to move to negative rates and has continued to take the view that rates must be normalized (raised). That is far more serious than you might imagine. To even entertain backing down from negative interest rates means they have to admit that Keynesian/Marxist economics has completely failed and therein socialism, which is based upon the very principle that government CAN and is CAPABLE of managing the economy. This is the real question presented in the American presidential elections, yet nobody will articulate it in this manner. Hillary still preaches the same failed socialist agenda as if government can even do anything other than attack people who earn more money as did Emperor Maximinus of Rome, but pretend to give it to those who produce less. Just before Paul Volcker became Federal Reserve Chairman (August 6, 1979 – August 11, 1987), he delivered his Rediscovery of the Business Cycle in 1978 (published on May 3, 1979 hardback). If you Google this book, you will see our site comes up first. You can find used copies around $500. Why is this book so rare? Because before Volcker became Fed Chairman, he told the truth. This “New Economics” was all about empowering government to manipulate and control the economy. Even Larry Summers, who is the father of Negative Interest Rates, has publicly admitted that government cannot forecast economic declines. Implicitly, he too is conceding that the “New Economics” has failed and his negative interest rates is now bankrupting pensions and has underwritten government debt like never before. Summers has pushed society over the edge. 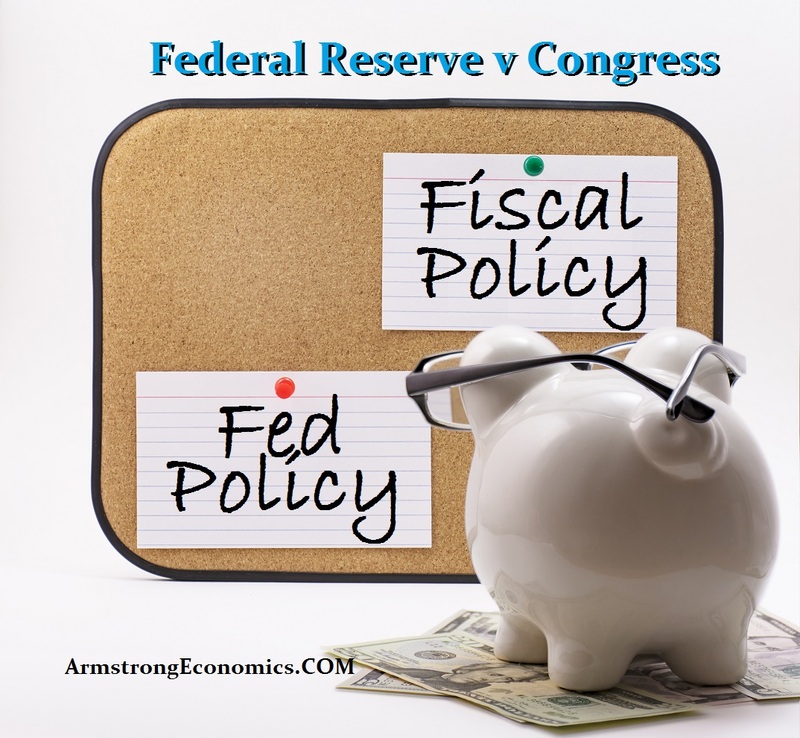 The conundrum in which we now find ourselves is where global central bankers can gather at the U.S. Federal Reserve’s annual symposium in Jackson Hole, Wyoming, but all they can do is hope something happens to save them. Governments are beginning to abandon the grip of austerity forced upon Europe by Merkel, which has greatly suppressed economic growth and created an economic depression exactly as what took place during the 1930s. The option of deliberately creating deflation was the policy of Germany only because they misunderstood the causes behind the German hyperinflation of the 1920s. Germany has blamed simplistically the quantity of money rather than the collapse in confidence due to the communist revolution creating the Weimar Republic. The failure of the economy to rebound in Europe and in Japan, while the United States has been only a dead-cat-bounce, led to governments insisting politically that central banks maintain and extend their own stimulus efforts. Politicians are incapable of managing the economy so today they look to the central bankers – tag you’re it. It is clear, central bankers are in a state of panic. They are looked upon as the sole economic magician and this political shift for responsibility has overburdened them dramatically. They know all too well that serious structural reforms are now necessary, but that involves politicians since it crosses the border into fiscal reform. With politicians preaching the same nonsense like Hillary that has driven us to the brink of this disaster, there is no hope of reforming career politicians who rely upon socialism to get elected: “Vote for me and I will reduce what you get” is not a reality politicians want to face. Nonetheless, central bankers simply can’t be seen to be giving up on this Keynesian/Marxist policy Volcker called the “New Economics” and Larry Summer pushed all the way to Negative Rates. The bankers are now trapped, unable to reverse policy without sending a signal that they have failed. The same policies are not working at all. This is the conundrum. 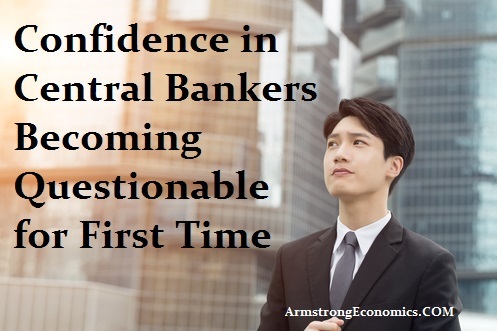 The great fear the bankers have is the collapse in confidence, which is on the horizon. 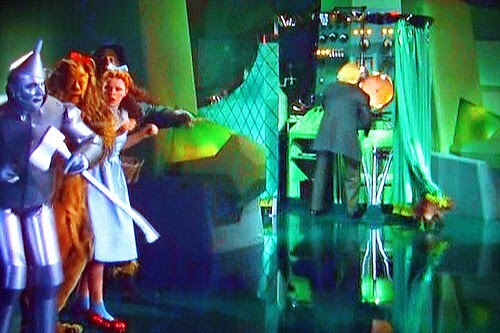 They wake up from a nightmare in cold sweat fearing the curtain will be pulled back and the world will witness there is no wizard controlling the world economy as in that film – the Wizard of Oz. The central bankers tremble at market sensitivity to any change in the perception of what they are up to next. They sought this power of a demigod, and now live in fear that they might be discovered as confused and powerless. Currently, this is all about policy makers being unable to admit complete and utter failure. Therein lies the foundation from which a Phase Transition can emerge. Once the majority begin to realize that the central bankers have been like con-men selling a false dream and politicians cannot change the very way they run for office promising to take other people’s money in the Robin Hood role, in that moment of reality, that is when the stampede begins with a mad rush to private assets. That is what sparked the German hyperinflation. FIRST the collapse in government and then the only buyer of public debt will be central banks. That is the end-game in monetization of debt. With Hillary at the helm, this will be a very evil crash and burn. People are more like going to hoard wealth and withdraw from banks than they are to buy government debt at negative interest when you wake up and see it is like Frank Sinatra’s song – send in the clowns. Oh, don’t bother. They are here.